Ab'ul Hasan Yamīn ud-Dīn Khusrau (1253-1325) is one of the most celebrated poets of medieval India, writing both in Persian, the courtly language of Muslims of the Sultanate period, and Hindavī, the vernacular language of the Delhi area. Also known as Tūtī e-Hind (=Parrot of India) and “Turk of India” for his poetic eloquence and fluency in Persian and Hindavī2, Amīr Khusrau has stood for a major cultural icon in the history of Indian Civilisation for almost seven hundred years. In this paper, we delve into his work and try measure it on the standards of modern history writing in order to establish how helpful the work is, in reconstructing the past of Medieval India. I am a Turk of Hindustan, I answer in Hindawi. I don’t have an Egyptian sugar to speak Arabic. In the course of this paper, we will begin with the life of the poet - the personal, political and social upheavals that he encountered and how they further shaped his consciousness and understanding that was reflected in his very mature writings. Mun tun shudam tu jaan shudi. Although Amīr Khusrau included much autobiographical information in his writings, the details of his origins are not clear. His father was Saifuddīn Shamsī, who is said to have migrated from Central Asia, and was married to the daughter of Imād al-Mulk, an Indian Muslim. Though the first and second-generation Turkish immigrants were generally an elite group who looked down on recently converted Indian Muslims, it appears that intermarriage did take place between the two communities. It is said, that Khusrau was proud of both sides of his lineage and his writings symbolise a synthesis of the two different cultures. Thus, he appropriately called himself an “Indian Turk”4 and; in India, the designation ‘Turk’ came to be synonymous with ‘Muslim’. Although Khusrau’s father was an illiterate man, but he made sure that his sons received proper education. He died when Khusrau was eight and as a result, the boys5 were raised by their maternal uncles and grandfather. Khusrau writes with great fondness about his grandfather6 who was the most influential figure in his life during his formative years. Even before he reached his teens, he began to compose his poetry in Persian. In terms of the language of instruction, he would have been educated in both Persian and Arabic, perhaps some spoken Turki, and definetly used Hindavī. It was at the age of twenty that Khusrau began his career as a professional writer, when he began composing verses in praise of his patrons. For the next fifty years, until his death in 1325, Khusrau was a court noble and a poet, initially in the court of other smaller nobles and princes, then later permanently at the court of the Sultan of Delhi. Serving five rulers7 and witnessing the rule of several more, he managed to survive the political intrigues of the various factions and individuals at work in Delhi and outside. In medieval Islamic culture, eulogistic poetry was one of the principal means for a ruler to establish and propagate his cultural and political legitimacy. It is hence that court poets were not the objective recorders of the character and the deeds of their patrons; they present only an idealised image of the ruler, his rule and the ruled. But as Peter Hardy states, “It would be easy to dismiss Amīr Khusrau as a typical Muslim Court poet and eulogist, but it would be unwise.” And here, it is also very essential to underline that Khusrau was not only a courtier, but a a Sūfī mystic as well; one of the favourites of the famous Sūfī saint Nizamuddin Auliya. During his lifetime, Khusrau travelled from one part of the country to another and acquired vast knowledge of the subcontinent, studying its culture, languages, flora and fauna as he came into close and personal contact with the people belonging to various walks of life. Such a cosmic experience of men and manners was bound to, and in fact did, endow him with a broad and humanistic approach towards society. So, here we have a court noble, a Sūfī mystic, an extensive traveller and a poet. Every aspect has its role to play in his composition. But we must also look at the less explored identity of Khusrau, as the Historian. Khusrau, who never claimed to be a historian wrote prolific records of what he saw and what had happened during the reign of the various Sultāns he served in Delhi. His works are very similar in terms of raw content to that of any other travellogue or history of that time.8 Yet, for scholars studying the past of medieval India, he remains to be an inevitable study. 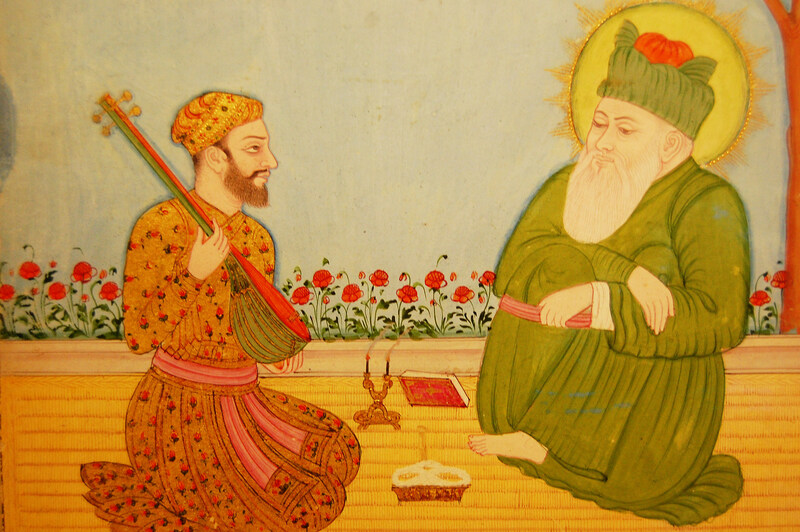 Amīr Khusrau’s account of the kings and nobles was based on his personal knowledge and experience. He wrote about Kaiqūbād’s meeting with Bughrā Khān, as he had accompanied Sultan to Awadh. He wrote about Jalauddin’s early campaigns on the similar basis as he was one of the nadīms of the Khiljī Sultān and used to attend special majilis. He wrote about Duwal Rānī and Khizr Khān, Allāuddīn’s campaigns in the Deccan and numerous administrative measures, market control, Mongol policy and so on. Khusrau’s major works include his five dīwāns- Tuhfat al-Sighar (poems of adolescence), Wasat al-Hayāt (poems of middle life- twenty to thirty four years of age), Ghurrat al-Kamāl (poems of maturity) collected in 693/1293; Baqiyya-yi-Naqiyya completed in 715/1315 and Nihāyat al-Kamāl; Khamsa- comprising of Matlā al-Anwār, Shirīn-i-Khusrau, Majnūn-Laylā, Āīnā-yi-Sikandarī and Hasht Bihisht; Rasā’il al-Ijāz or Ijāz-i-Khusrau, a treatise (akhlaq) on prose composition, and five risālas. His masnavīs, as many historians observe, offer insight into more than just history. A most important work is Qirān al-Sadain (=conjunction/meeting of two planets), which he completed in 688/1289. It is written in Persian and includes ghazals12. Its main theme is the meeting and the conflict (and its resolution) between BughraKhān and his son, Sultān Muīzzuddīn Kaiqubād. Besides that, Khusrau also gives information bout the army, the climate in Awadh and the description of the city of Delhi. Khazāin al-Futūh (=Treasure of Victory) was completed in 711/1311 and talks about the life and times of Sultān Alāuddīn Khiljī, his conquests and administrative prowess. Of peculiar interest to modern historians may be his description of the destruction of the temple at Somanāth. Tughlaq Nāmā was completed in 720/1320 and details the ascension victories of Ghiyāsuddīn Tughlaq against Khusrau Khān. The Āshiqā Duwal Rānīwā Khizr Khān was completed in 715/1316 is an account of the love story between Khizr Khān, (son of Alāuddīn Khiljī) and Duwal Rānī, daughter of Rājā Karn of Naharwāla. Nūh Sipihr (=Nine Skies) was completed in 718/1318, its main theme being the memorable deeds of sultān Qutbuddīn Mubārak Shah Khiljī but consists largely of the details of his court and the flora and fauna and languages of India. Lastly, Miftāh al-Futūh completed in 690/1291 was a masnavī regarding the battle campaigns and victories of Jalāluddīn Khiljī. After dealing with the requisites of our main concern, let us come to the larger question–to what extent can we consider Khusrau a historian? Before this, we need to answer that what are the parameters of judging a work as a work of history and judging a writer as a historian? The historian should inform us about the changing trends in polity, society and economy. His ideas should be more analytical rather than descriptive; the accounts should be based on hard facts and evidences. He should be concerned with groups preferably rather than with individuals; more with human decisions and agency than with Divine Causation and so on.14 Historian Peter Hardy criticises medieval writers on the grounds of not matching to these scales. However, one should keep in mind that these are very recent developments in history writing. It would be same as saying that, “the Mughal ruler Aurangzeb was not secular,” and ignoring the fact that the notion of secularism is a very recent one, and nobody was secular at that time. Khusrau’s works become handy as far as the factual information with historical relevance is concerned. The later historian Baranī quotes Khusrau on many occasions to confirm some of the major points of view on past events. In many works Barani’s assertion was supplemented by the facts furnished by Amīr Khusrau. Also, Khusrau is eloquent where Baranī chooses remain silent. For example, Barani has not given any account regarding the rising of Tughlaq dynasty but, Khusrau has provided detailed information in this regard. 2.) Hindavi later developed into what is today known as Hindi in North India (especially in Western UP). 4.) Interestingly, Nizāmuddīn Auliyā’, Khusrau’s spiritual master (pīr) called him the ‘Turk of God’. 5.) Amīr Khusrau had two brothers. 6.) It was at his grandfather’s place, that Khusrau met the young Sūfī Auliyā’ for the first time. 7.) Khusrau served Kishlū Khān, young prince Khān Malik Sultān Mohammad, Kaikūbād, Jalāluddīn Khiljī and Alāuddīn Khiljī. 8.) It is said that he wrote ninety-two separate works in all. If this is true, then we have lost a considerable portion of his work. 9.) A masnavī is a long narrative that is in the form of verses. It deals mainly with historical and romantic themes. The authors may (and often do) digress onto tangents in between their narration, which relate to, in the case of Khusrau, socio-cultural, ethnographic, linguistic and even botanical and zoological descriptions. 12.) A ghazal is a structured poem, which deals mostly with romantic themes. It often deals with a lot of emotions viz. love, anger, sadness etc. It is, of course, a very popular form of Urdu poetry today. 14.) This explanation is of course, based on the post-Enlightenment Positivist understanding of who a Historian should be and; what his methods and objectives are, or ought to be. 15.) I. H. Siddiqui states that it is strange that Hardy did not pay attention to Mohammad Habib’s work on Khusrau. 16.) Hardy, Peter Historians of Medieval India: Studies in Indo-Muslim Historical Writings (1960, Luzac). 19.) Notice how this analysis fits into Hardy’s larger categorization of medieval historians as theologians, who had little knowledge of writing history. I flit about in this garden on the branch of your fortune. For crows and ravens eat the leftovers of royal falcons. 22.) Khusrau in his writings, mentioned nine stylists. Sheikh Ali Hujuwir was one of them, his famous work Kashful Mahajib was the first work on Sūfīs and Sūfīsm ever written in Persian poetry. 29.) Or Chronicler, as some may prefer.